Could you spell “koinonia” off the top of your head? What about “ankyloglossia”? 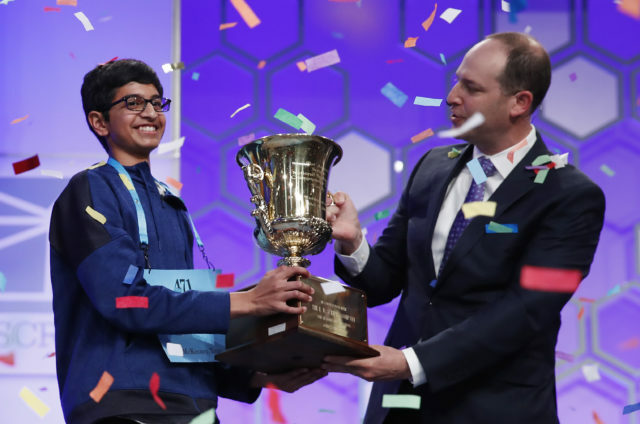 That’s what 14-year-old Karthik Nemmani was up against when he won the biggest Scripps National Spelling Bee in history. The competition, which took place in Oxon Hill, Maryland, saw Karthik win against 12-year-old Naysa Modi as she stumbled over the word “bewusstseinslage”. Karthik is from McKinney, Texas. His family moved to the town specifically so he could go to a school that takes part in the Scripps programme. His father explained that Karthik could spell the word “horse” with blocks at the age of three, and won his first spelling bee aged four. Karthik’s winning word, which he beat 515 spellers to get to, was “koinonia”. The word means Christian fellowship or communion. Karthik, the 14th consecutive Indian-American champion, took home more than $42,000 (around £31,000) in cash and prizes. Naysa will try to take the top spot next year. She will be in eighth grade, which is the final school year that spellers are eligible for the competition.